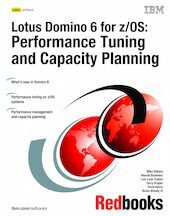 This IBM Redbooks publication helps z/OS system programmers and Domino administrators to monitor and tune Domino 6 for z/OS. It identifies factors that affect performance and provides recommendations to tune the configuration and parameter settings for optimal performance. Tips are provided for the operating system, the disk I/O subsystem, the network, and the Domino product. In addition, it includes guidelines for capacity planning. A background in z/OS and experience with Domino is assumed. This version, updated for Domino 6, includes tips on the zFS file system and new monitoring tools and techniques.